As expected Apple has released the minor iOS 8.1.1 update to all users of iPhone, iPad and iPod touch and it is now available for download. 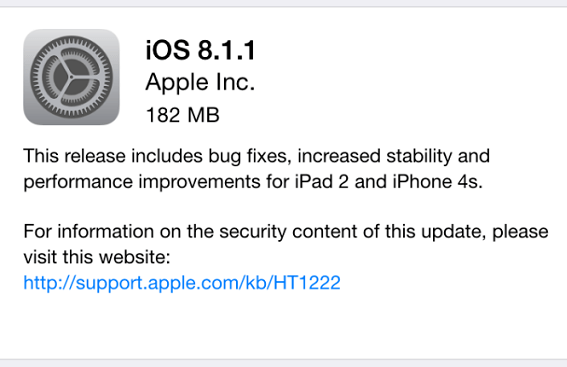 The update has been made available through over-the-air for users who are already running iOS 8 and through iTunes. You can also download the IPSW files for the operating system from the links given below if you want to install the update manually. While the update is of minor level it is focused on two particular devices and does bring more stability, bug fixes and performance improvement for older devices, namely iPhone 4S and iPad 2nd generation. Perhaps the biggest change iOS 8.1.1 brings is that it closes the vulnerability that allows team Pangu to untethered jailbreak iOS 8. Just as we warned you earlier this version of the operating system won’t allow you to jailbreak your device. While it may be possible to jailbreak iOS 8.1.1 using other exploits it is unlikely that Team Pangu or Evad3rs will release jailbreak for this particular version of iOS. We believe that will happen after the release of next major release such as iOS 8.2. So if you are into jailbreaking then it is best to avoid iOS 8.1.1 at all costs. You can download the iOS 8.1.1 IPSW using the direct Apple links below. Still on iOS 8.1 or earlier? Use our guide to jailbreak your device.